Playing with dead chick to inspirational piano music & poorly given dialog ? Baby cuttlefish embryos can see outside their translucent egg cases and learn which animals are worth hunting and which aren't while they are still developing. Basically, they're visually hunting before they're even born. While other animals have been known to recognize vocal and chemical signatures of their parents while still in their eggs, this marks the first discovery of an animal to learn visual images before birth. How creepy to be a crab and know that somewhere there's a developing cuttlefish baby watching you, waiting until the day it can escape from it's little egg pod and eat you. Awesome. Yes, I'm from Australia.. no i've never eaten one. (or seen it on the tags plz correct me if it is there, i swear im not retarded. ), but i did see one in my garden one day. The witchetty grub (also spelled witchety grub) is a term used in Australia for the large, white, wood-eating larvae of several moths. Particularly it applies to the larva of the cossid moth Endoxyla leucomochla, which feeds on the roots of the Witchetty bush (named for the grubs) that is found in central Australia. The grub is the most important insect food of the desert and was a staple in the diets of Aboriginal women and children. The different larvae are said to taste similar, probably because they have similar wood-eating habits. Edible either raw or lightly cooked in hot ashes, they are sought out as a high-protein food by Indigenous Australians. 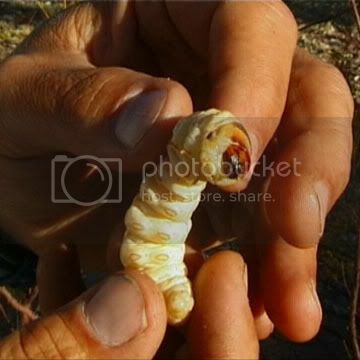 The raw witchetty grub tastes like almonds and when cooked the skin becomes crisp like roast chicken while the inside becomes light yellow, like a fried egg. I can't believe this isn't in the tags- I even checked the Latin name. As a matter of fact, I'm wearing asbestos right now because I'm pretty sure I missed it. But in case I didn't... I present to you the naked mole rat. Attractive, no? This little creature lives in Africa. Why is it so WTF? Alphabetically or in order of importance, I ask? 1) It is neither a mole, nor a rat. Discuss. It is actually related more to chinchillas and raccoons. 2) They are eusocial. Which means they live in a colony like bees. Yet they are mammals. Tiny, ugly mammals. 2a) Yes, that means there is a queen, and she grows in length to accommodate the babies she constantly pumps out. If she dies, another naked mole rat female gets an influx of hormones to do the same thing. 3) (and kind of 2aII) Many naked mole rat colonies, especially ones in zoos, are made of virtual clones. Because the queen is usually impregnated by either 1-4 of her brothers or her sons, many colonies have a very limited number of gene differentiations. Sadly, they have not mutated into giant monsters and ravaged Tokyo or started shooting lasers out of their eyes. Yet. 4) They can run backwards as fast as they can run forwards. Considering they spend their lives underground in tunnels, that comes in handy. 6) You know the old saying, "You'll eat a peck of dirt before you die?" NMR's use their giant buck teeth to dig tunnels. They mostly eat tubers they come across while digging tunnels, but also eat insects and roots. 7) Those tunnel systems can stretch for over two miles. Considering colonies are generally around 80 NMR's who are about 4" long, color me impressed. 8) Those tunnels are much like anthills- there is a toilet cave, a food storage cavern, and even a small 'drop hole' near the entrance of a tunnel to foil snakes and other predators. 9) Their lips seal behind their teeth so they don't actually get a mouthful of dirt (but I like the peck of dirt thing so I'm keeping it) and their ears and eyes can also seal shut so they can dig wihtout having to stop and gripe "Ow, you guys, hold up a sec, I got something in my tiny beady eye." 10) Yes, my icon is of my kid in a naked mole rat costume. And she hates Kim Possible. See, if you take a naked mole rat out of it's colony, it will die. A while ago I adopted my sister's "ugly fish". But I have no idea what kind of fish one of them is. He is about 7" long, 3 1/2" tall. At first I thought he was a pirahna, but not I'm not too sure... I've named him "The Brute". Disclaimer: I know this got floated around the net a while ago, so apologies to those who've already seen it. I checked the tags here for "praying/preying mantis", "hummingbird" (which doesn't actually exist), "hunting", "Mantodea" (also doesn't exist), and "predator", and couldn't find this there either. And if you want to read more about mantids and their raptorial forelegs, binocular vision, 300º head articulation, etc., here's the Wikipedia entry. Not bad, for an order descended from proto-cockroaches. US Food and Drug Administration warns us against raw tomatoes, as there were quite a few salmonellosis cases recently linked to them. Safe are some smaller varieties, like cherry tomatoes, and also any tomatoes sold on the vine. My question to you, dear WTFers: how would salmonella even get on (IN?!!! dum-dum-DUM) tomatoes, and if it does, why would keeping the tomatoes on the vine prevent its spreading? The government's not explaining. WARNING: Some of this post may be extremely disturbing to sensitive viewers. Some images may be disturbing to not-so-sensitive viewers. So occasionally, whether due to radiation, toxins or just plain randomness and probability, embryos and foetuses can experience odd mutations. Usually, these result in a nonviable organism that either dies in utero, dies in early infancy or is sterile. But sometimes, weird things happen. Two of these 'weird things' (and I apologize for not having a better term) are parasitic and conjoined twins. This is my favorite fish the in world. I looked through the tags and did not find anything on this fish. If it has been posted I apologize. It is so amazing because it goes through a very weird change. When it's young it's beautiful, black and yellow striped with a stout body and high fin, thus it's name. In Petsmart we classified it as a species of goldfish but it's really more of a subtropical fish. They loose that high fin, which turns into a short more shark like fin and look, to me, like a cat fish. They turn that ugly grayish color and really aren't as appealing to look at. However most of these fish in captivity do not survive due to a need in climate change and the fact that they grow to three feet long. I figured I would post the main place on YouTube where people can find David Attenborough -narrated clips - including MANY WTF clips! And yes, I am aware that David Attenborough in and of himself is not WTF nature, he's more likw FTW Awesome. Some interesting WTF ones of note: Partnerships (Featuring a blood sucking bird, among others) and Macaroni Penguins (if only for the name of these awesome penguins). Found this a few days ago when I looked up sea monsters. I thought it was definitely worth a WTF. This stingray migration doesn't look real to me, but it's popped up on quite a few sites in the past few days. Anyone from Key West, Florida seen this kind of thing in real life before?